In 2014, we celebrated the 50th Anniversary of the building of St. Andrew’s. Our guest preacher for this landmark occasion will be The Rev. Carl Russell, rector of the congregation for our first worship in the buildings on Christmas Eve 1964. Please join us, and help celebrate with a reception following the worship service. 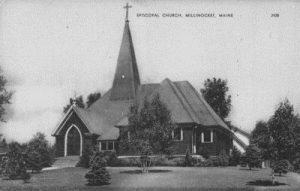 The year before the town of Millinocket was incorporated (1901), the people of St. Thomas parish in Winn, along with the Bishop of Maine, decided there should be a church in the budding town of Millinocket. And so, St. Andrew’s Episcopal Church was completed in 1901, as a mission of St. Thomas, ready to accommodate approximately 100 parishioners. The original church was located at the corner of Colby St and Highland Ave, now property of St. Martin’s Catholic. St. Andrew’s became a self-supporting parish with wardens and vestry in May of 1944. With the growing number of families with children, room was needed for the church school, so the vestry voted to buy a house next door to the church. This growth led to a need, as years passed, for either enlarging the existing church or building a new church. The church acquired new property and the new St. Andrew’s was erected at 40 Highland Avenue. The church also bought the house at 39 Highland Avenue directly across the street from the new church, for a rectory. The first service in the new St. Andrew’s was Christmas Eve, 1964. Over the years St. Andrew’s grew into a large, strong congregation. The church included a growing Sunday school, choir, women’s fellowship guild, altar guild, twice weekly bible studies and a parish visiting group. In the mid 1980s, the primary employer, Great Northern Paper Company began downsizing and eventually closed in 2003. The downsizing started a decline in the overall size of the community and our congregation. When the mill closed, St. Andrew’s rallied to the needs of the community in one of its finest moments. Episcopalians from around the diocese (and elsewhere) sent money, food and other necessities to help those who were suddenly struggling to survive. St. Andrew’s became one of the distribution centers for practical, hands-on assistance. A convoy of 20 oddly-assorted vehicles from all corners of the Diocese full of donated goods made its way through snowy January roads and was greeted by members of the community waiting to unload and help to distribute the necessities of existence. The unexpected death of our rector in 2005 was a crisis for St. Andrew’s. However, members of the congregation have come forward as strong church leaders. Our deacon, Robert Landry, along with clergy from the area, ably managed the difficult task of leading us forward spiritually and prayerfully until we were able to call an interim. 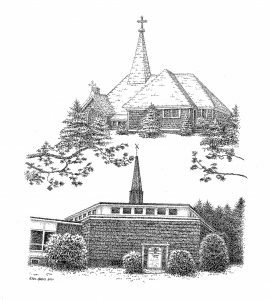 St. Andrew’s has faced many challenges, but we have remained faithful as a congregation. We are grateful to Father Robert L Ficks III (2007) and the Rev. Amelia Hagen (2008-10) for serving as our interim priests. And we are pleased to have had The Rev. Levering Sherman serve as priest in residence from 2012; retiring in 2015.